This could not be more perfect. Is this already the best Halloween costume of 2018? A few behind-the-scenes photos from the upcoming "Modern Family" Halloween episode have been released, revealing Cameron Tucker’s absolutely hilarious costume. 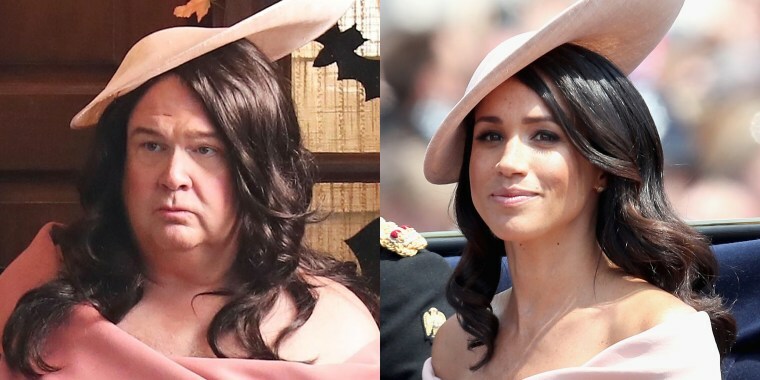 Cam, played by Eric Stonestreet, will apparently dress up as Meghan, Duchess of Sussex, and his costume could not be more perfect. He copied Meghan's look from the Trooping the Colour parade in June, from her off-the-shoulder Carolina Herrera dress right down to her asymmetrical fascinator and dark, flowing waves. He even mastered her royal body language, crossing his hands demurely in front of him just like the duchess. So regal! The funny snapshot was captured as the “Modern Family” cast filmed the upcoming Halloween episode last week in Los Angeles. Naturally, Cam’s husband on the show, Mitchell — played by ginger-haired Tyler Ferguson — is going as Prince Harry. It’s no surprise that the “Modern Family” crew is pulling out all the stops for this year’s Halloween episode. The upcoming 10th season, which premieres this week, may be the last full season of the beloved sitcom — though there may also be a shorter 11th season in the works after that, according to Deadline. In any case, Mitch and Cam could not look more stunning as the Duke and Duchess of Sussex. Who knows if the royals are “Modern Family” fans, but we like to think Harry and Meghan would be proud!